Let’s just change the name of the NBA to the “No Balls Association.” In a league in which nearly every team is flawed in some way, in which the East is wide-open enough that Isiah Thomas and Eddy Curry muttered the word “playoffs” this week, in which every elite team (Phoenix, Dallas and San Antonio) had spare assets to swing a deal and separate themselves from its competitors, in which every 2007 first-rounder possesses more value than it would in a normal season … nobody had the testicular fortitude to swing a major deal before Thursday’s trade deadline. This was like watching 30 blackjack players stay on 16 against a 10 at the same time. It was crazy. It was unfathomable. Really, everyone felt that good about their team? Nobody felt a pressing need to add one past piece or shake things up? Normally I’d be fine with this, but unfortunately, I paid for the NBA League Pass and suffered through far too many crappy games over the last four months — from a quality standpoint, it’s been one of the most disjointed seasons since the ABA merger. I can’t remember another season when this many teams needed to make a move in one direction or another. Incredibly, none of them did. Ric Bucher believes that every potential contender remembers how the Heat won a title by slapping together two good months, giving them false hope that they could emulate Miami’s success this spring by just being patient. Hogwash, I say. There are so many quality reporters, columnists and bloggers covering the league at this point — all of us educated to the degree that you could ask, “What’s Jamaal Magliore’s cap figure?” and we’d say right back, “8.3 million, expires this summer” — that these GMs know we’d jump down their throats for any dumb move. Hell, we sit around WAITING for them to screw up. Now they’re scared. I really believe that. Ten years ago, Rod Thorn probably would have dealt J-Kidd for that pu-pu platter that the Lakers offered him. Now? He knows he’d get slaughtered for not getting a blue-chipper back. So he stalled and stalled and hoped to get Andrew Bynum from the Lakers, or Atlanta’s No. 1 from the Suns … and then the deadline passed and now he’s stuck with Kidd’s monstrous contract and monstrosity of a divorce trial until the summer. Hey, at least he was smart enough to deal Vince Carter before Vince fled for free agency. Oh, wait, he didn’t do that, either. Now you can be the GM who has the guts to make a deal. See what deals you would have made in ESPN.com’s Trade Machine. Should have used Mo Williams (a free-agent-to-be who will get overpaid by someone else this summer) to dump Bobby Simmons’ contract (which runs for another $30 million and three years after this one) and gotten an expiring deal and a pick back (Dallas or the Lakers wouldn’t have bit on that one?). Plus, it would have weakened them for Oden-Durant purposes — with no point guard and Terry Stotts (the white Doc Rivers) at the helm, they would have been unstoppable. Anyway, I asked “someone in the know” why the Bucks wouldn’t have pursued a deal like that and here’s what he told me: “Well, Larry [Harris] signed Simmons to that deal, so if he used Mo to get rid of that contract, he would have been admitting that Bobby was a dumb signing.” That makes sense, I guess. He overpaid Bobby by 25 percent and Bobby’s been injured the past two years … we wouldn’t want anyone to think that signing didn’t work out. The only team with enough cap space to facilitate a three-team deal (where they’d absorb a big contract and pick up a No. 1 for its troubles) … and naturally, it didn’t do anything. For instance, let’s say the Knicks wanted to get Vince from the Nets for Jamal Crawford and Channing Frye, only the Nets didn’t want to take Malik Rose’s contract back. Charlotte comes in and says, “We’ll take Rose ($7.2m per, expires 2008) if you take Othella Harrington back ($2.2m per, expires 2008) if you gave us $3 million and Chicago’s 2007 No. 1 pick.” So the Nets get 80 cents on the dollar for Vince (Frye and Crawford, an underrated player with a reasonable deal); the Knicks make a huge splash with Vince; and the Bobcats pick up a No. 1 in a loaded draft. Everyone wins! Again, probably too logical of a scenario for this league. Already earmarked for an “F” before giving away its high No. 2 pick (an asset in a loaded draft) for Anthony Johnson, who’s bounced around the league more than Karrine Steffans and only knocks them further away from Oden/Durant. Hey, do you realize the Hawks passed on Chris Paul and Randy Foye in the past two drafts, they’re paying $13 million combined for Ty Lue, Speedy Claxton and Anthony Johnson, and there’s a decent chance they won’t own a single pick in the 2007 draft? It’s true. I might have to hold the “Atrocious GM Summit II” just to pay homage to Billy Knight’s anti-brilliance. Mired in a “we’re drafting between eighth and 13th every summer” rut and desperately in need of a splashy move to get better (using expiring contracts to pick up a blue-chipper) or worse (trading Ray Allen or Rashard Lewis for a package of picks and players). Naturally, the Sonics didn’t do anything. Apparently its front office signed off on a Mike Bibby deal with the Lakers for picks and expiring contracts, only the Maloof Brothers nixed it because they couldn’t stomach the thought of Bibby playing for their archrivals. This is funny for four reasons. First, there IS no Lakers-Kings rivalry anymore — it died about three years ago and wasn’t even that heated to begin with. Second, the Kings have no chance of being relevant again for the rest of the decade — not with some of the contracts they’re carrying. Third, it’s never a good idea for owners to place personal feelings ahead of the best interests of their team (just look at the Celtics, who should have traded Pierce last summer but didn’t). And fourth, Bibby’s just about washed up — he couldn’t guard Tommy Heinsohn at this point. Anytime an agent has a chance to opt out of a deal for free agency and decides, “You know what? We’ll keep this contract, it’s fine,” they’re basically telling you, “My guy is overpaid and on the verge of being washed up.” So congrats to the Maloofs for screwing their fans over. As their penalty, they should be forced to hop in a time machine, travel back to last weekend in Vegas, then walk the Strip for two straight nights wearing $30,000 Rolexes and three-piece suits covered in cash. 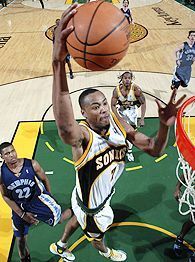 Could the Blazers have used Magliore’s contract and pursued the likes of Andre Miller, Gerald Wallace, Rashard Lewis, Mike Miller, a Brent Barry/Beno Udrih/No. 1 package or whatever else was out there? Yeah, absolutely. But let’s cut them some slack because they’re headed in the right direction — just think where they’d be if Paul Allen hadn’t squashed the “Darius Miles/Theo Ratliff for Penny Hardaway’s expiring contract and David Lee” deal last winter. Every columnist who praises Isiah this season — because anyone who lords over a 24-31 team with a $129 million payroll and no lottery pick clearly deserves praise, right? — should be obligated to mention that Paul Allen’s veto saved Isiah from getting assassinated by an irate Knicks fan after Lee’s first 25-rebound game for the Blazers this season. When everything’s said and done, Isiah’s decision to buy out Jalen Rose (to save $500K) over keeping him, sending him home and hoping his contract could land a blue-chipper in February will go down as his dumbest decision of the past four years. And that’s saying something. Jalen’s cap figure (along with Frye, Nate Robinson and Chicago’s No. 1) easily could have landed them someone in the Vince-Allen-Pierce-Iverson-Kidd group. How can a team with a $129 million payroll sabotage their trade hopes for $500K? My head hurts. It’s all been said. Well, except one thing: If G-State was pushing Jason Richardson around the league like everyone claims, why wouldn’t the T-Wolves have stepped in there? G-State was dumping him because Richardson is struggling to return from knee surgery and they’re already playing the “we’re paying a lot of money for an injury risk guy” game with Baron Davis. … If you’re the Wolves, and you can’t land one more blue-chipper because you’re roster is loaded with bad contracts, don’t you owe it to KG to roll the dice with someone who COULD be a blue-chipper if he’s healthy? You’re telling me G-State wouldn’t have jumped at an offer of Ricky Davis and Eddie Griffin’s expiring contract to dump Richardson when they have to pay Monta Ellis next season? Plus, Ricky, Eddie and Stephen Jackson could have joined forces on a team that plays 15 minutes from downtown Oakland. … That could have led to the most horrific late-night NBA incident in the history of horrific late-night NBA incidents. I feel cheated.